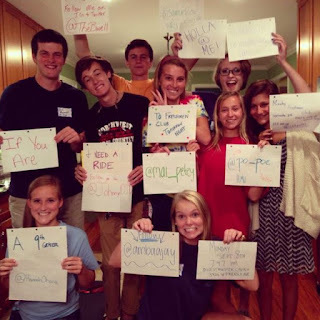 Last week we shared some thoughts about a social media strategy for your Young Life club. Yesterday I saw a few pics pop up on my TimeHop app that reminded me of 2 additional ways to help you kick off the new school year using Instagram. The first is to gather all of your senior leaders or Campaigners folks and take a pic of them holding signs with their contact info on it. Have them all Instagram or Tweet it out so folks who need rides to club can know who to contact. 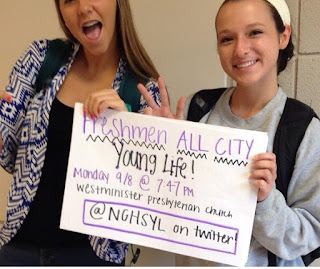 When you post the pic on your YL account, make sure to tag all of the folks in it. Do you know what's even better than making a cool Instagram square by putting text on a background using Phonto? Making an Insta square with real people holding a poster with those same words on it. Instead of typing out all the details about club, bring a poster board to the cafeteria and ask folks to hold it while you snap a pic. Take different ones and ask folks to post it on their own social media accounts!